This Miles Redd designed living room, in the house of Veranda contributing editor Danielle Rollins, has been featured quite extensively in various media outlets. Here is an image from Veranda. 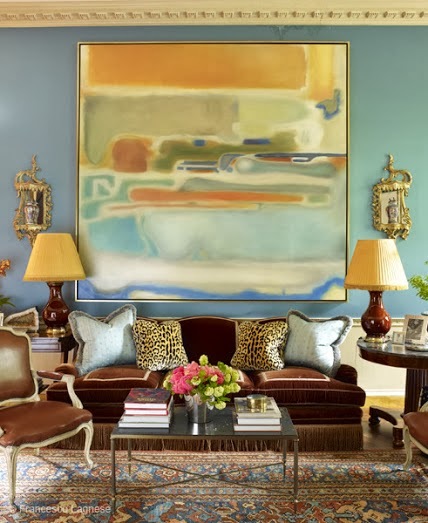 The room is full of rich colors and materials; the walls are noted as being upholstered in Brunschwig and Fils silk satin, and the rug is antique Oushak. But to me, the star of the room is the magnificent painting by Agustin Hurtado. Its sheer size and the softly abstract style are beautiful, and I also love that it incorporates all of the colors in the rug and the room. Same view, more closely cropped, on Miles Redd’s website. 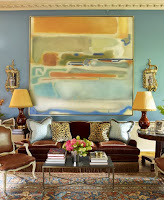 A view towards the other side of the room, via Miles Redd’s website. Finally, my favorite view of the room shown in Town & Country. This gives a good perspective on the importance of the painting in the overall design of the room. I decided to check out artist Agustin Hurtado’s website, and was happy to see a blog post on the ‘before’ state of this painting as it was being created. I love to get a peek into the inspiration and creation process of art, so this was a great find! 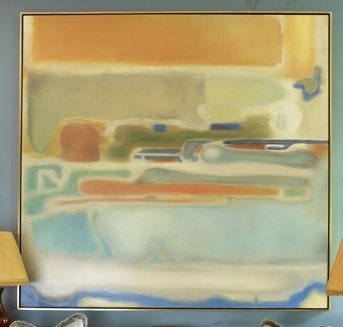 Note that Miles Redd hung the painting with the orange on top; the artist painted it with the orange on bottom. That’s the beauty of abstract art, it can be interpreted in many different ways, and even hung in many different ways. I personally love really large scale art, and art that both reflects the taste and style of the homeowner and the colors of the room has particular appeal to me. I know that many artists and designers don’t like it when the art matches the sofa; what do you think? Do you prefer for art to match the room? I personally think that clients graviate towards art that appeals to them on many different levels, and one of the most important is color. Often, the colors of the decor are the colors the client prefers - and naturally the colors that they will gravitate towards in art. Usually this applies to abstract art more than traditional art, however, when the subject matter is often as important. Love this post Holly. I have had a few clients flip my work around as well. I think it's great that someone can see something different that the next person. It really is so subjective. Love it. I hate to disagree with my friend Christina, but as an artist it drives me nuts when people flip over my work. That said, if an abstract works in another orientation, its a pretty solid composition. 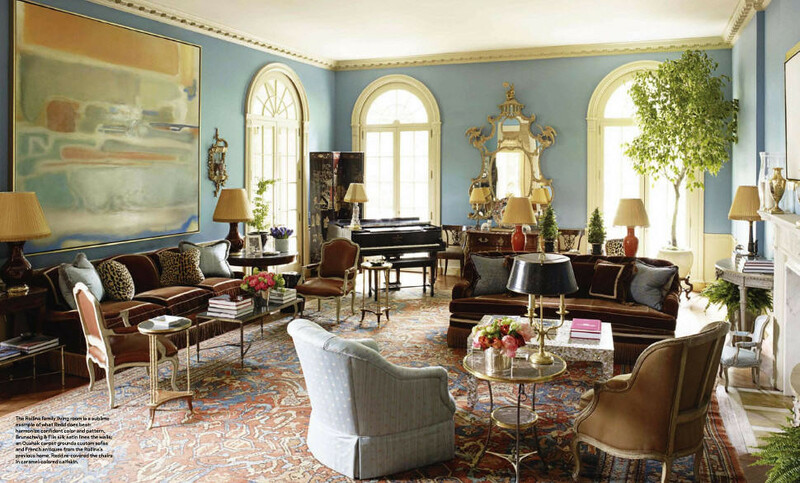 That is one of my favorite Miles Redd rooms and the painting is incredible. I prefer the artist's interpretation personally but totally get why it got flipped in the first place. My guess is there was just too much of the same colour going on in the lower half of the room. Raising the predominant colour to the highest part of the painting deflects the attention upwards and away from the obvious. Gorgeous! this was fun to see-i love how miles redd broke the rules! !-great post!! For me personally, I collect art for the art not for decor. It does not need to match the room, in fact, it is not even a consideration. I believe you should build a room around art and rugs. It seems everything works beautifully. It is looking like you have captured all the colors of the world in your room. Painting is looking beautiful and your room also. However you choose to look at ~ you've inspired me to get my big brushes out! The room is stunning and I'm so glad you've visited the artists page. I'm sure he's appreciative as well.